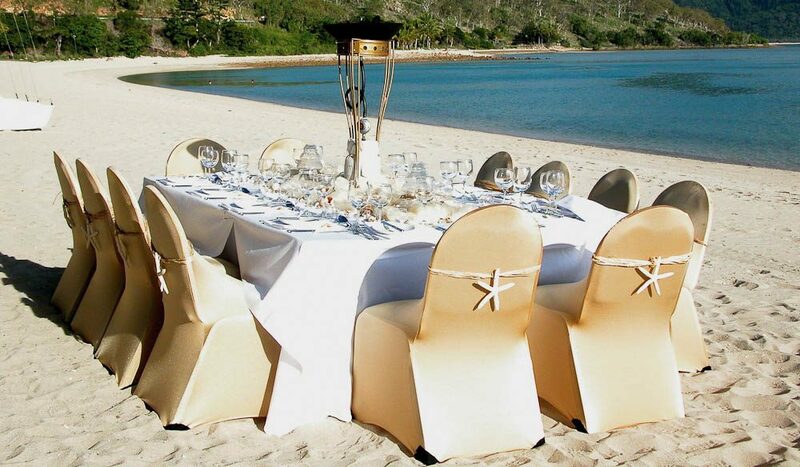 Beach dining Hayman Island style. On a typical balmy summer’s eve, it’s far too beautiful outside to eat indoors. So why not take the dining room out onto the beach and make a special feast of it? If you’re lucky enough to have secured beachfront accommodation, pack up the dining table and chairs, grab some candles or string up some fairy lights between the trees, spray on the mozzie repellent and embark on an seaside feast. Otherwise, a backyard can also be transformed into a special setting. It could be a simple BBQ spread of perfectly-charred sausages, steaks and salad; takeaway fish and chips; or a grand seafood extravaganza of crab, lobster and prawns. With the sea breeze in your hair, whatever’s on the table will taste even better outside – guaranteed.